The following photos are of the Power Supply Unit built using the SG-IY1 diagrams from Sam’s Laser FAQ. This power supply was built for the Cyonics Uniphase 2214-SLT30 and 2214-40MLAM air cooled argon laser heads. This power supply is capable of delivering up to about 12 Amps into most small air cooled laser heads. I am planning to also use this power supply to run some linear arc lamps I have, for use in other projects. I tried to get some fairly detailed photos but it may be difficult to make out all of the components and values and such. This is really the first time I had built any type of large power supply, and the first time is always the ugliest with such projects. I have plans in the work to build a pass bank supply for a much larger 3 Watt water cooled argon laser, possibly this summer (2009) and I’m hoping that I will be able to make a much pretty build. Front Perspective of the Power Supply (below): The pass bank for this PSU is in the rear-left quadrant of the supply, the transistors are mounted to the big aluminum heatsink which is visible behind and under the meters. 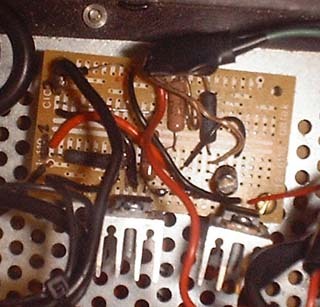 The meter above the heatsink is an old analog ammeter, and the digital one in the box in front is a digital voltmeter module. You can see that it is powered by a seperate 9 volt battery. 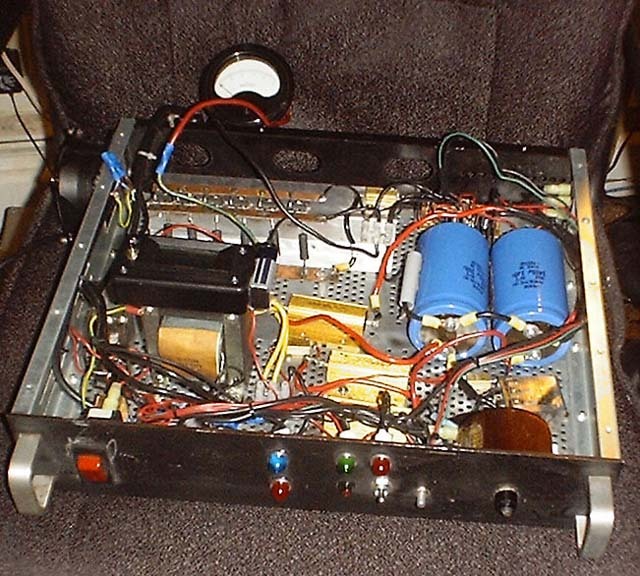 This power supply, as built, did not have any 9 volt power feeds available so I just mounted the 9v to it’s case. The two large capacitors on the right are the primary DC power filter capacitors. I had to special order these capacitors, they were not too expensive. You can see the filament transformer to the lower left, sitting beneath the volt meter and next to that, the gold colored power resistors. There are two 1 Ohm resistors and one 0.2 Ohm resistor. 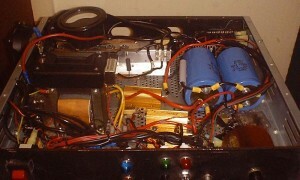 Small home built air cooled argon power supply top view. Front Control Panel of Laser Power Supply (below) : This is a shot of the front control panel, it’s probably one of the ugliest home made cases I did. I was more interest in functionality than appearance and was still lacking the equipment and skills for making good looking control panels. This case is actually from an old power supply, but the front panel had many holes in all the wrong places. Being a thick piece of aluminum it was difficult to fill in and I finally settled on using an aluminum alloy called Durafix. Durafix has a 732F melting point and can be used to ‘weld’ aluminum. While it does hold fairly well, i do not believe it welds in the normal sense. This project in itself could deserve it’s own page. I ground down the face of the, then used a stainless steel wire brush over the entire surface, right before I used the Durafix and filled in the holes. I then painted and drilled the panel and mounted the indicators. The following is the layout of the front panel. The big red breaker is a 15 amp main Breaker/Power Switch which as a remote tripping capability for it. Such a breaker can be used for an interlock, but it should not be the only safety device in a setup. The BLUE indicator lamp is the ‘mains power’ light, this lights up any time there is wall power. The RED indicator lamp below that is the ‘Power on’ light, showing only when the breaker is turned on. The GREEN indicator lamp is the ‘filament power on’ lamp. The RED BUTTON below the GREEN indicator is the filament on button. It is connected to a relay which latches to an on state, until the mains power is discontinued. The RED indicator next to the GREEN indicator is the ‘DC Power On’ lamp. The switch below it is the ‘DC Power’ enabler switch. 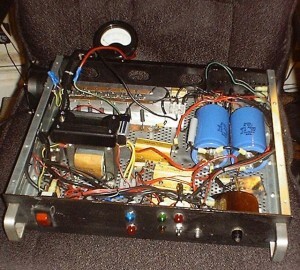 The small silver colored knob is the pass-bank power adjustment and the black knob to the right of that is the Variac for adjusting the current to the filament. Top Down View of Control Panel (below): The next photo is just a top down view of the control panel so you can see the mess of wiring involved there. The variac is clearly visisble on the left hand side with it’s mass of copper windings. This variac barely fit into the space allowed and was probably a bit underated. I’m sure more modern designs use some sort of switch mode supply to supply the AC filament current. Power Resistors (below): These are the three power resistors required for current limiting. They are fairly large, but the aluminum heat sink design of the power resistors makes them much smaller which is great for tight installations. They do throw off a lot of heat when the power supply is running full tilt, so it’s a very good idea to keep them well ventilated with moving airflow. 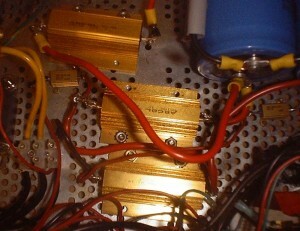 Power resistors for an SG-IY type design. Top Perspective View of PSU (below): This next photo is a top down view with the ammeter moved out of the way so that the pass bank is more visible. Again the digital gauge is for voltage and the analog is to read the current. The analog gauge is wired between the center tap of the filament transformer and the pass bank. The Pass Bank (below): This is a better view of the make shift pass bank I built. The transistors need a large amount of cooling so I went with a closed heat sink with a hollow core that I pulled from a line printer. The air from a blower flows in one side of the heat sink and exits inside of the power supply. With a small sized blower type fan unit, a lot of air moved through this supply and kept things reasonable in regards to temperature. There are mica insulators and heat sink compound between the transistors and the heat sink. As you can see in the pictures, I used strips of printed circuit board to act as buss bars for the transistors and resistors. This worked very well for this kind of a lash up although it could probably use a plastic shield with a sticker that mentions it’s high voltage DC there. Having built it myself for personal use, it was not such a large concern. Pass Bank Driver (below): This is the driver board for the pass bank. It looks like there are very few components on it, but that is because I surface mounted a lot of the other components. If you look at the SG-IY1 power supply design on Sam’s Laser FAQ you can get an idea for all the components required. In most of the argon supplies (mostly older designs) I have seen most of the components are built right onto the heat-sink and use point to point wiring or stand off insulators with soldering points. 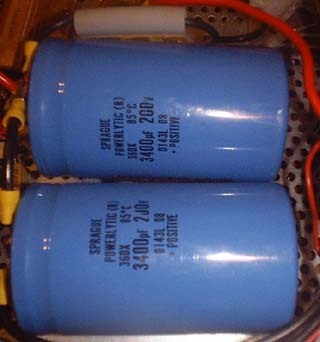 Filter Capacitors (below): The primary filter capacitors for the DC output. These are rated 3400uF at 200 Volts each and wired into the passbank circuitry.